In the previous chapter, you read about why we traveled to Oymyakon in winter, how were the first trainings, why things went wrong, how we “sewed” rivers, played the “Yakut” preference and dragged cars on the ice. But we don’t want to share our body heat! We ate so much food to help it keep warm and now what? – Just give it up to the space because of some physical laws?! No!!! We will isolate ourselves from the Universe, otherwise food will not be enough for all the atoms of the world! Therefore, we will not talk about how to run from the cold, but how to keep warm. Although it’s just a play on words. What material helps best to preserve warmth? Maybe wool, or down, or maybe even cosmic secret materials? You will not believe it: the air! Its thermal conductivity is very low in comparison to liquids and especially metals. For instance, copper conducts heat 20,000 times better, because the molecules density is much higher. But the best insulator is the vacuum. 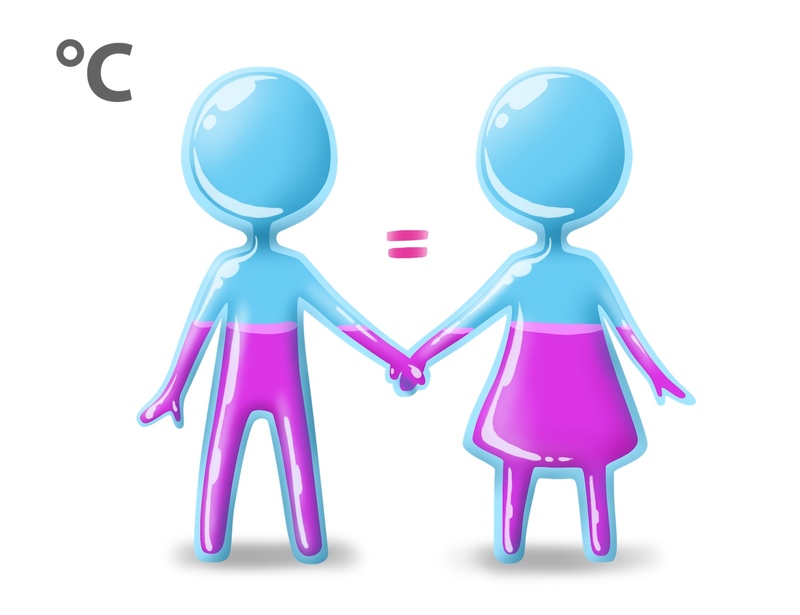 There are no molecules at all, so it is impossible to transfer the warmth. 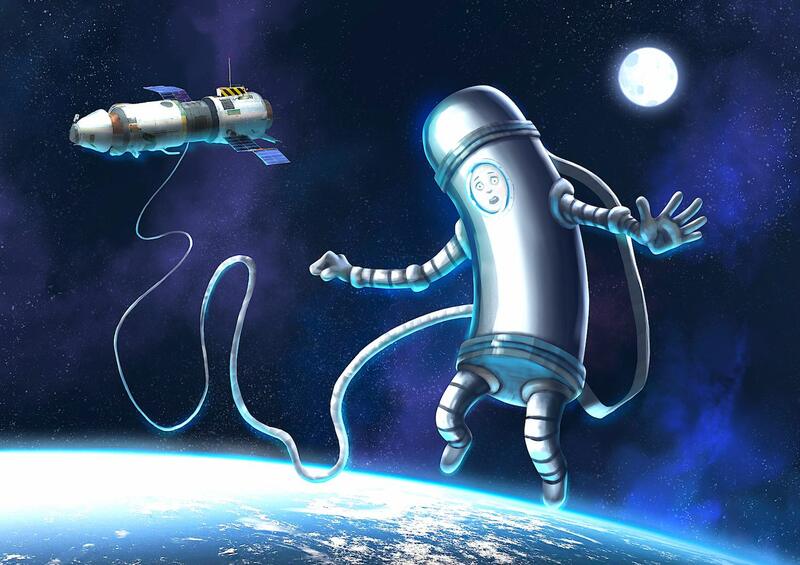 You can wear a vacuum jacket and get out into the outer space, because body temperature will be stable. Have you ever thought why wool socks are warmer than the synthetic ones? The answer is: because the wool consists of millions of hollow hairs containing air, so heat has to go a long way from one hair to another, in order to reach the surrounding cold air. 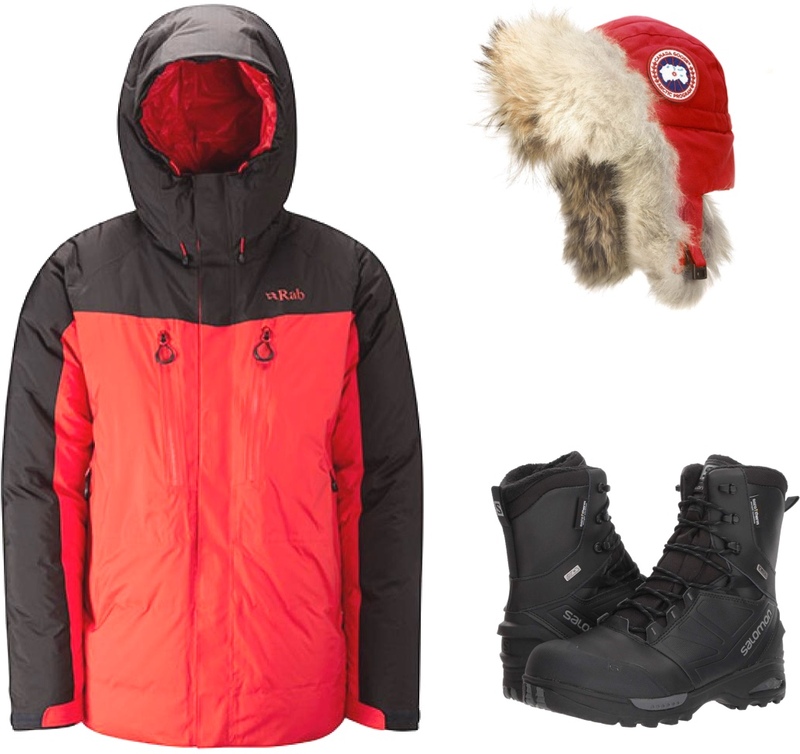 That is why natural down jackets are considered to have the best thermal insulation. The explanation to this is very simple: feathers create an air cushion between your warm body and the cold outside world. The down itself does not heat, it just keeps the shape. Fill Power or fluffiness is the main characteristic of down. The higher the fluffiness, the greater the volume of 1 gram of down and the thicker the air cushion. You probably heard from climbers that if you do not want to freeze your toes, you need to take 2 sizes larger boots. 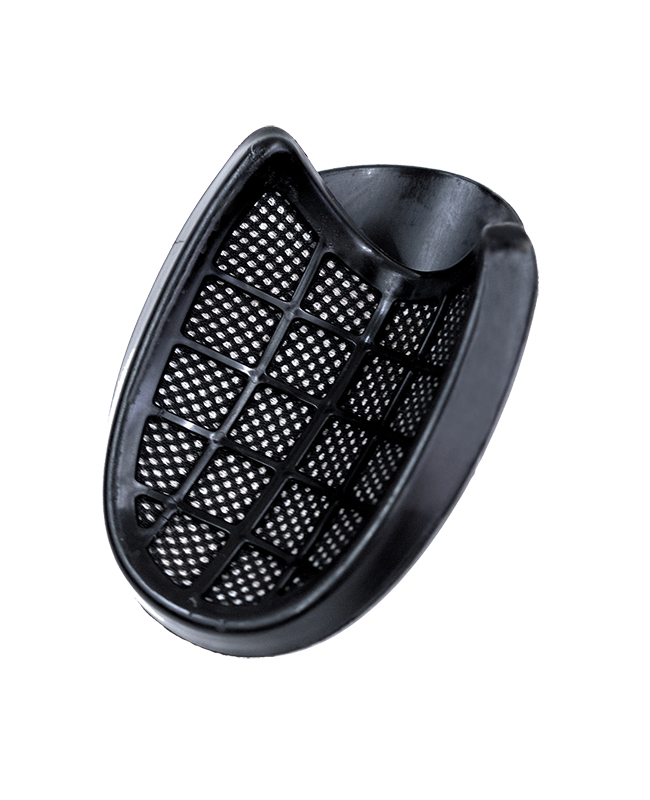 This is intended to create air cushions around the foot. The air has a much lower heat conductivity than any of the most trendy socks. But if the foot abuts the walls of the boot – the heat will escape much more quicker by the solid substance and you will have your frozen foot amputated. 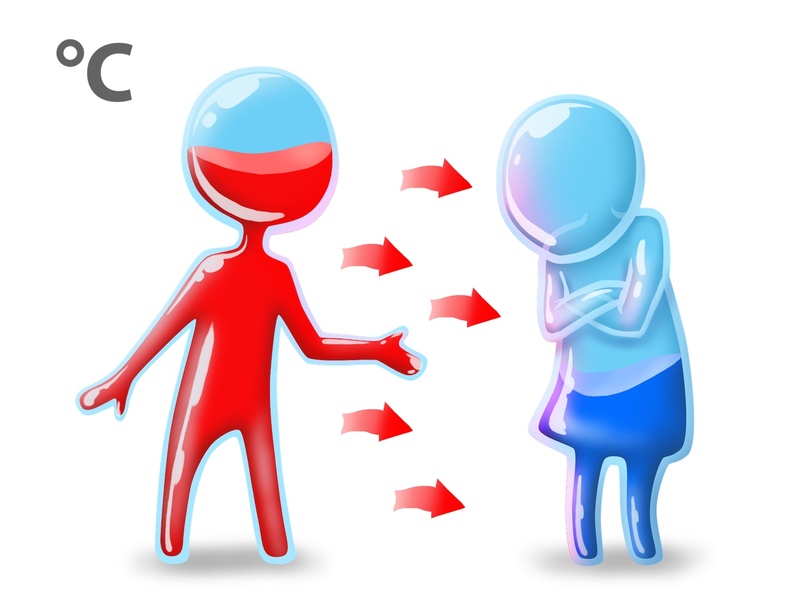 So, the best friend of the cold-sensitive persons is the air, but who is their worst enemy? The most cunning and instantaneous heat conductor is water. You will cool off 25 times faster, if someone pours out water on you in freezing temperatures. That is why,the first thing the rescuers must do when pulling a person out of cold water is to strip off the clothes of the victim. 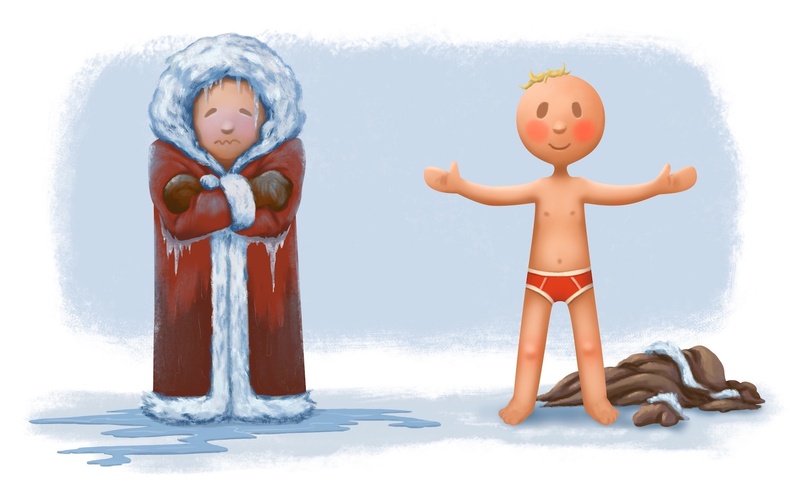 You are less likely to lose heat in the cold atmosphere being naked but dry than being in a wet jacket. 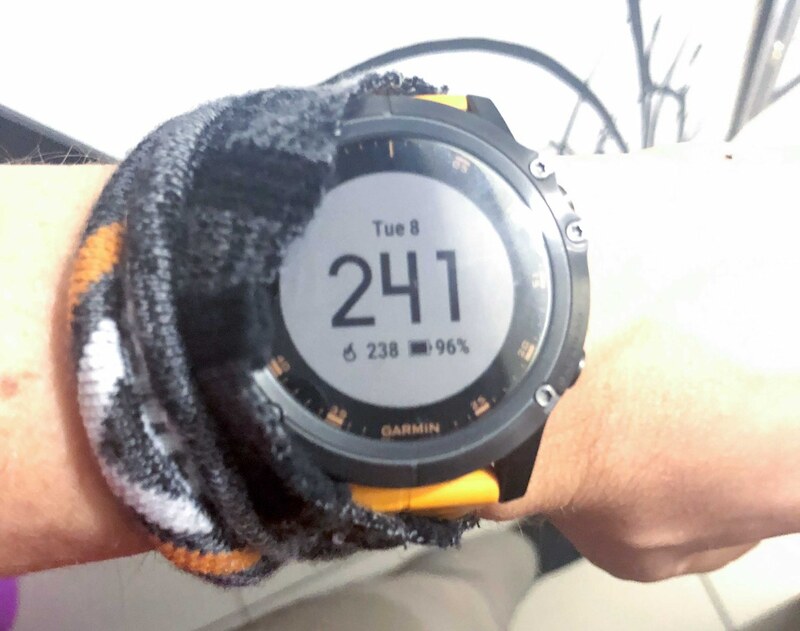 Therefore, while running and sweating (and it does not evaporate), the cold penetrates very quickly through any equipment and the runner freezes. There is another nuance about the cold: the convection or “heat transfer through air flows (wind) and liquids (currents)”. The same thing applies to water flow. When my friends and I tried to survive on a desert island, we were taught to keep warm in cold water. The main rule was “not to swim”. By moving in the water, you wash away the warm layer of the water that your body heated. Therefore, if you suddenly find yourself close to a large sinking ship among icebergs, take the embryo position, put your hands into your armpits and don’t move. The water around you will warm up a bit and you will be able to live a little longer. But that’s not certain. In summary, the main enemies of the equipment at ultra low temperatures are moisture and wind. Therefore, the runner must stay dry and protected from the wind. But let’s take a closer look at the runner from top to bottom. 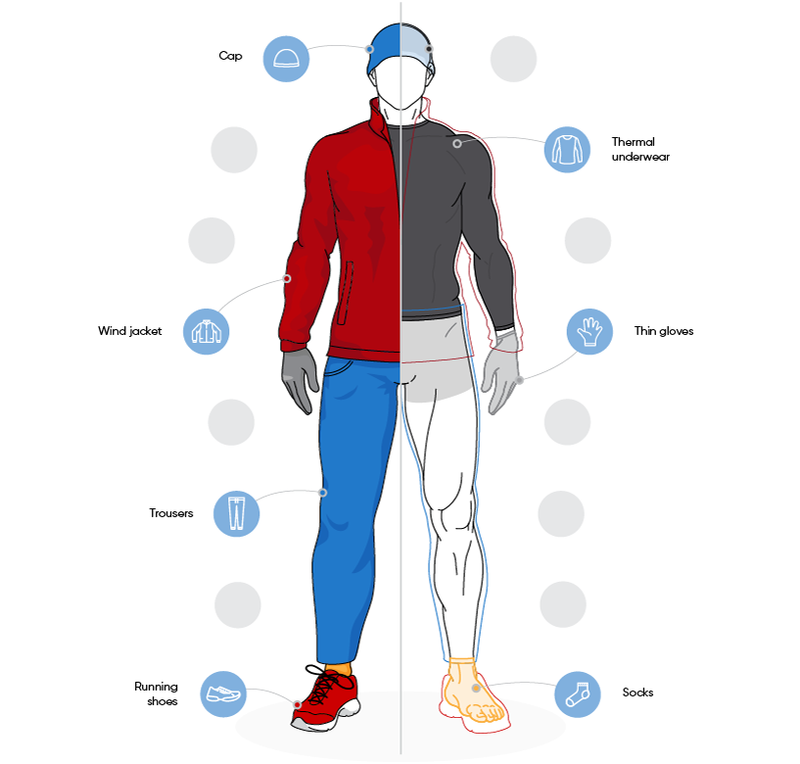 You don’t want to run without protecting your lungs at minus 60 °C (minus 76 oF), do you? If you do, get ready: first, your alveoli will freeze, then they will explode, you will start spitting blood, then pulmonary edema and death will follow. I suggest not to consider such a scenario. Therefore, when running in ultra-low temperatures (> -40 °C (-40 oF)), it is crucial to choose the proper mask. 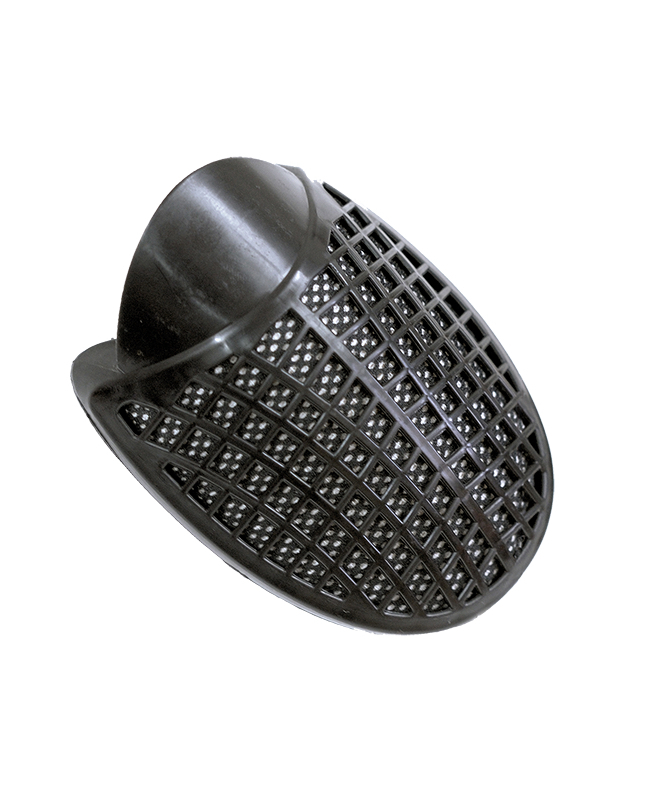 The mask is intended to create a microclimate by mixing exhaled and inhaled air. Thus, a layer of relatively warm (-10 °C (14 oF)) breathing air creates a wall between you and the frost. I think I bought all the masks models in the world. 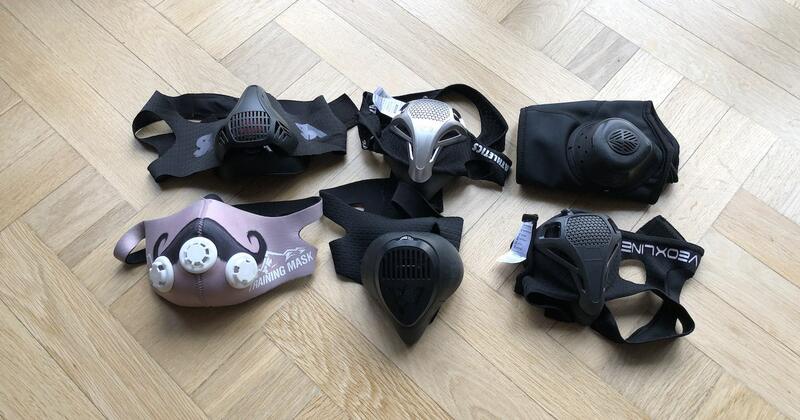 Mainly, these are hypoxic masks for lungs training, which limit the air flow. I can tell you right away – they all failed. Some masks had a too big hole, and while inhaling, the icy air would strike the very skin. Other masks have frozen instantly. And others were uncomfortable and did not fit tightly on the face. 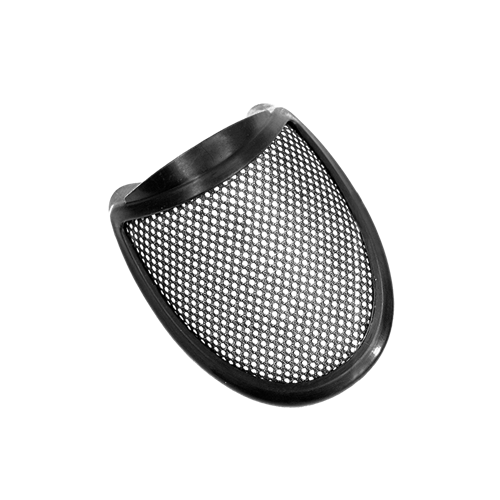 Only one mask allowed me to breathe in relative comfort – the Sayver thermal mask. 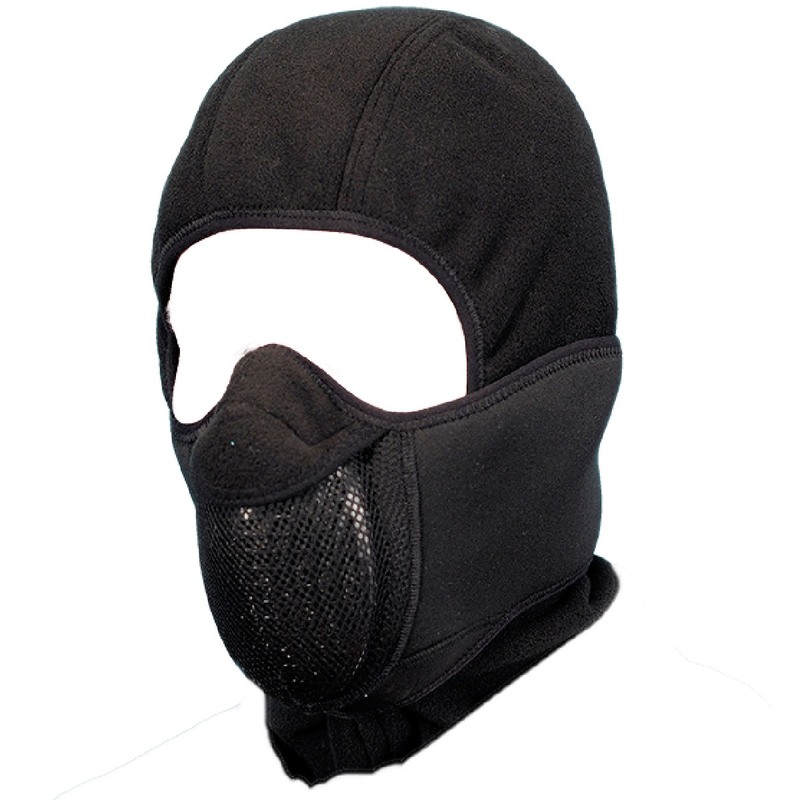 It is made of a windproof balaclava and a mask with replaceable filters. I bought two masks and 4 filters, to change them every hour. In fact, I would change them every 40 minutes, but they froze in 20 minutes. This is a normal phenomenon – any mask covers with ice – because you exhale moist air and it freezes. It is extremely difficult to breathe in the frozen mask, because the air passes more difficult, and you apply a greater effort to inhale, thus losing energy. Basically, it feels like a long-hour hypoxic training in a terribly cold atmosphere. To be honest, not the best entertainment. But as far as I know, nobody has yet invented the non-freezing masks. With a frozen mask, your exhalation air cannot break through the ice and out through the cracks. Moist air gets on your face, eyebrows, eyelashes, and you look like an ice dragon, who exhales smoke from nostrils. Lovely picture! By the way, about using the balaclava: I recommend putting on the membrane jacket hood over your balaclava and you’re good – your head will be warm enough. But why let your face freeze like that? Why not wear glasses or a ski mask? The thing is, they all sweat. All without exception. Regardless the model, wiping, ventilation and technology used. Your exhalation, which has water vapors, turns instantly into ice and grows thick. I had three options for protecting the upper part of the face: ski mask, ski goggles and simple cross-country eyewear. Everything sweats on this cold weather. 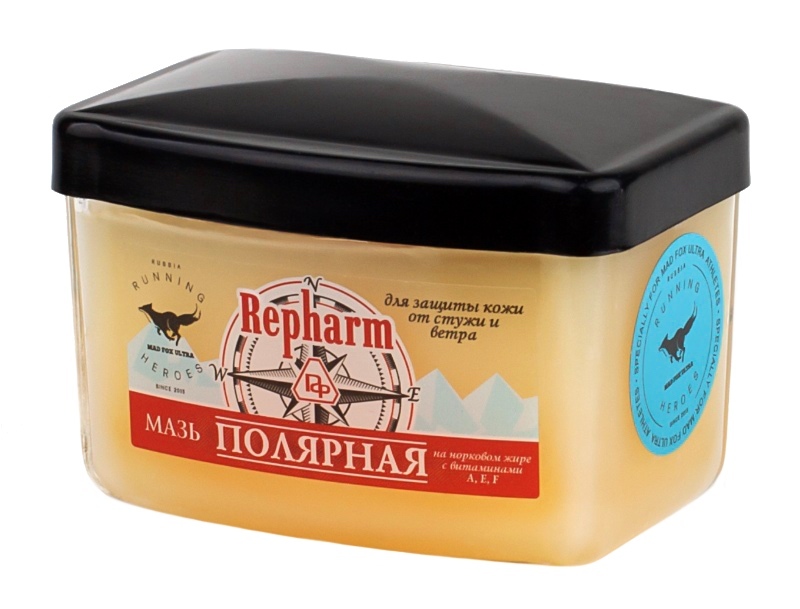 In order not to freeze your face, I recommend to grease it with fat or, for example, with polar ointment and repeat it every two hours. No additional cap is needed. Yes, even at -60 °C (-76oF). Honestly. But for your inner peace you can take one 🙂 Let’s go a little down below – the neck. The solution is simple – put on a merino buff and that will be enough. For protecting your body, you need to use the classic three-layer scheme: 1. Thermal underwear, 2. Insulation and 3. Protection. To be honest, I was afraid to run in three layers and so, at the training, I put on the fourth layer: a down sweater. But after 15 minutes, I sweated, got wet and froze immediately. Therefore, I ran in three layers. I can say it was not hot. I felt the cold stronger, but stayed relatively dry. The membrane outfit was invented so that the sweat does not drip on the body, but evaporate. This material releases water vapors, but does not let water in (rain) and the wind cannot blow through it. It represents the wonders of modern technology. Therefore, the main equipment principle in the cold atmosphere is using the membrane. So, the first layer is thermal underwear. 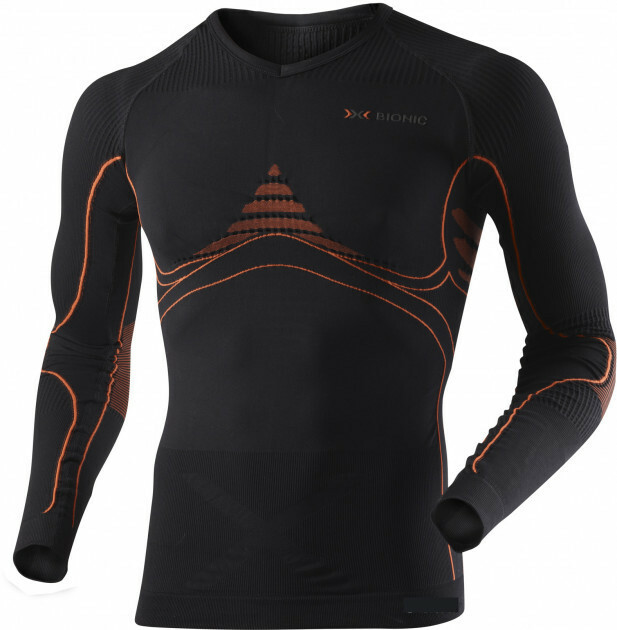 I chose the X-Bionic Extra Warm Energy Accumulator. 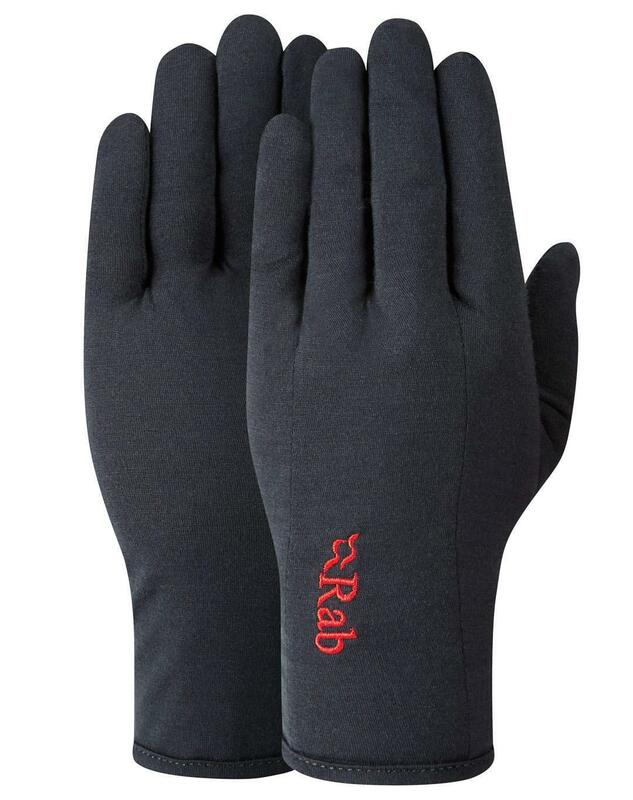 It is made of synthetic fibers, keeps you warm and wicks the moisture. 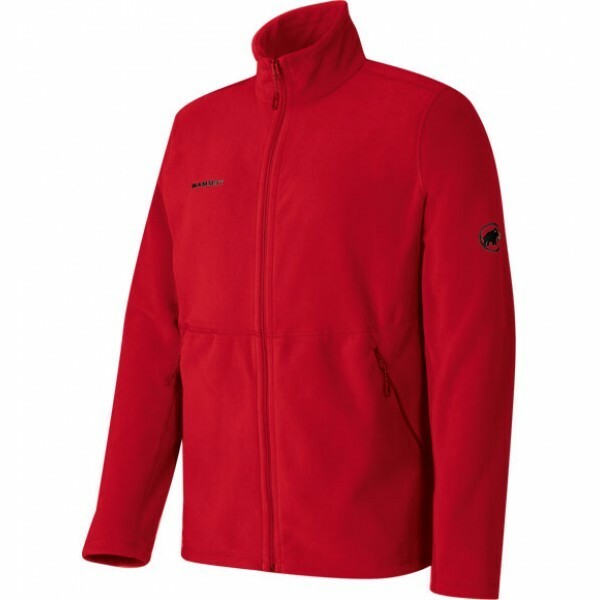 On top, I put on the Mammut Yadkin thick fleece sweater, and on it, the membrane Mammut Nordwand Jacket for climbing. After the race, when I took off my clothes, it was clearly visible that the sweater was covered with frost. 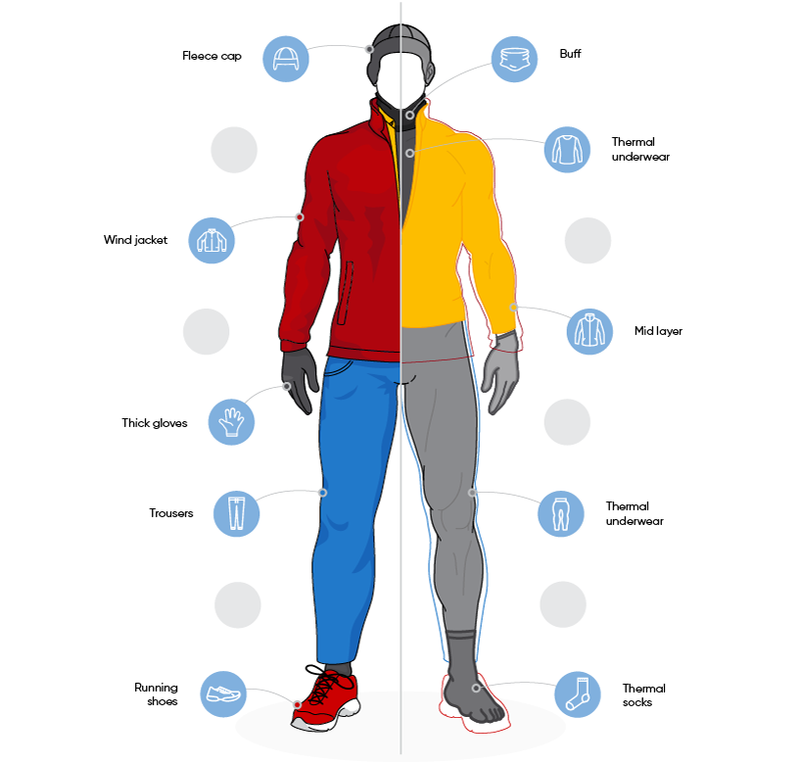 This means that the layers actually work: the thermal underwear pushed out the evaporated sweat to the upper layer (sweater), and it pushed out the sweat to the last layer (jacket). 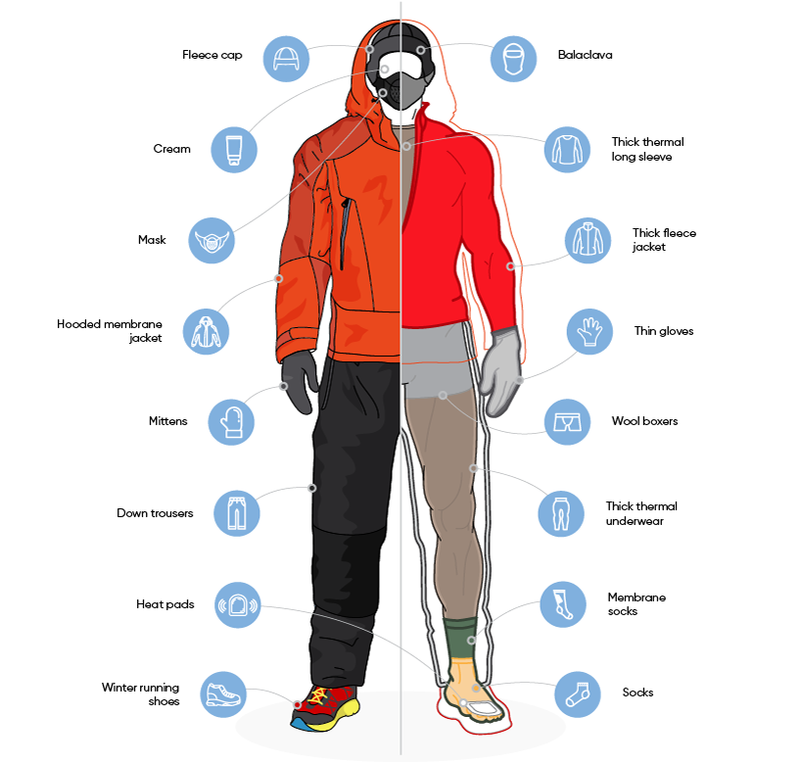 At this level the sweat met the cold air and froze, because the jacket has no insulation – it is just a thin membrane that protects from the wind. Ideally, there should be no frost. 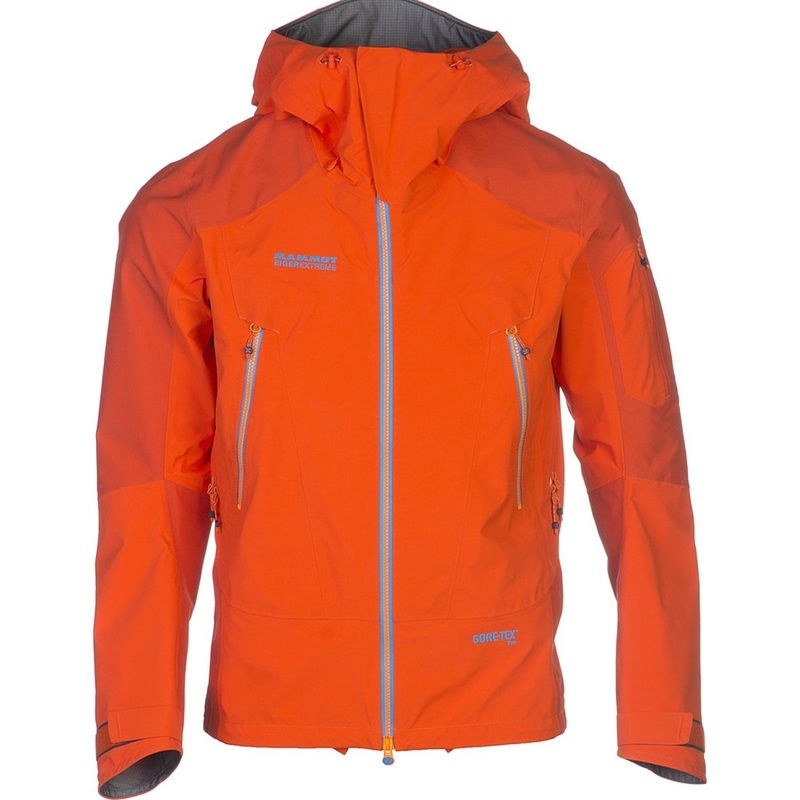 It may be worthwhile to take another jacket model, but stick to the same principles. At the training sessions, I discovered a strange thing about my body. Perhaps, everybody has it. Till this moment, I have not discussed this matter with anyone, but my elbows were terribly cold! After analyzing the situation, I realized what had happened. The runner’s hands are always bent in elbows and do not unbend for hours. 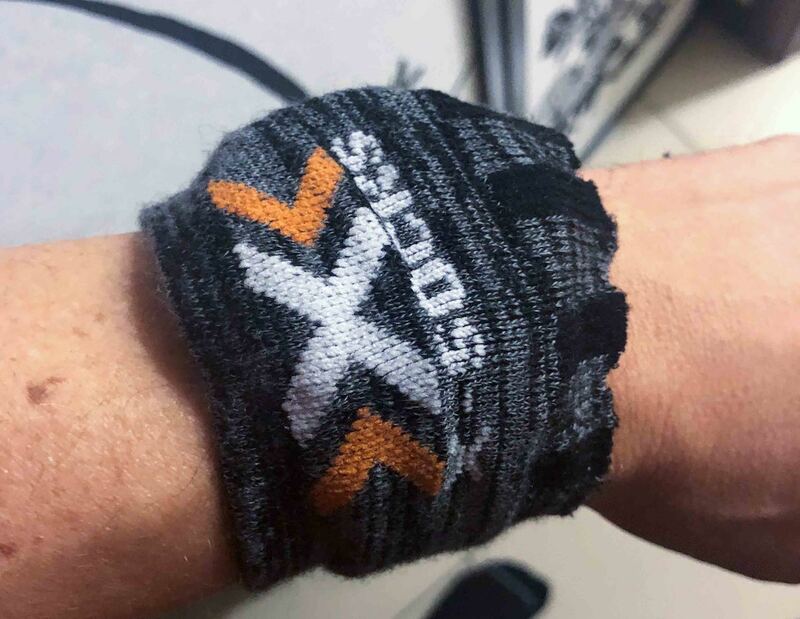 Because of this, the material pulls tightly at the elbow joint, and the cold penetrates quickly through this weak point. The best insulator is the air, remember? But at this joint there is no air, because the clothing fits tightly. What to do? We solved the problem simply: we made pockets of socks, sewed them on the sweater at the elbows level, and stuffed them with heat packs. This thing has not bothered me at all during the race. You may ask: “What about your knees? They also bend! ”Yes, they bend, but they unbend, too! The air circulates constantly, moreover, unlike the immovable elbow joint, the knee joint is warmed. Two layers. The first layer is a thin loose merino gloves. And the second layer is membrane mittens with primaloft. 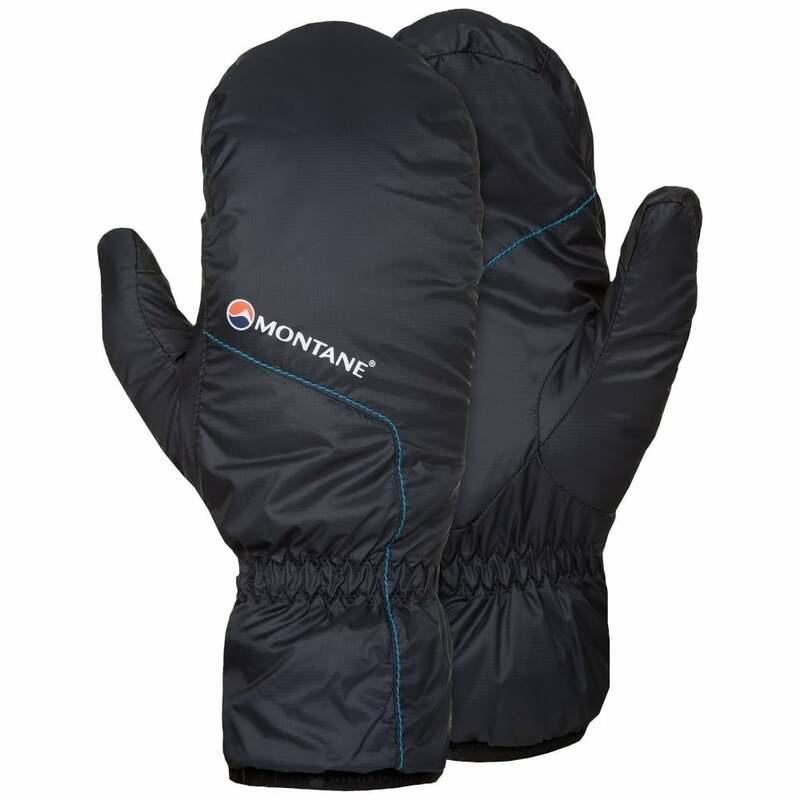 I used the Montane Prism Mitt. At first, it felt hot, but as my hands were sweating, I started feeling the frost inside. The guys discovered it when I asked them to change my gloves. If you feel that your hands are sweating, take off your mittens and check your gloves. I repeated this every few hours. Let’s go a little down below. 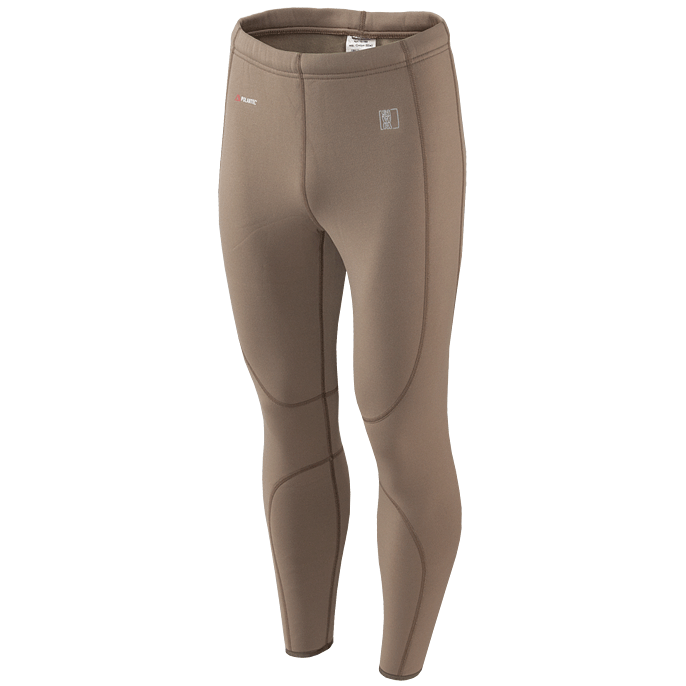 I wore woolen underwear, a pair of thick fleece tights, and at the top, down-filled windproof pants 800FP – Rab Photon Pants. 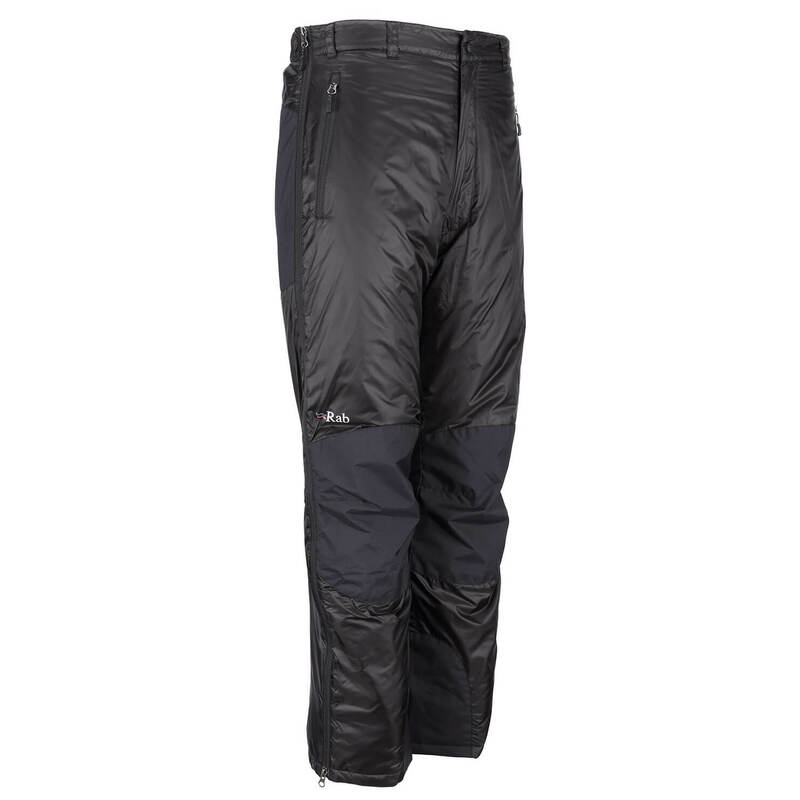 This combination of pants proved to be surprisingly stable, in terms of temperature: the knees were not cold, neither the private parts, and my pockets served as spare room for additional cap and mittens. After 20 km (12.5 miles), the only issue that arose was that my rear began to freeze, due to moisture. But it is not critical for such temperatures, so you can bear with it. Choosing the proper footwear is not so simple and easy. 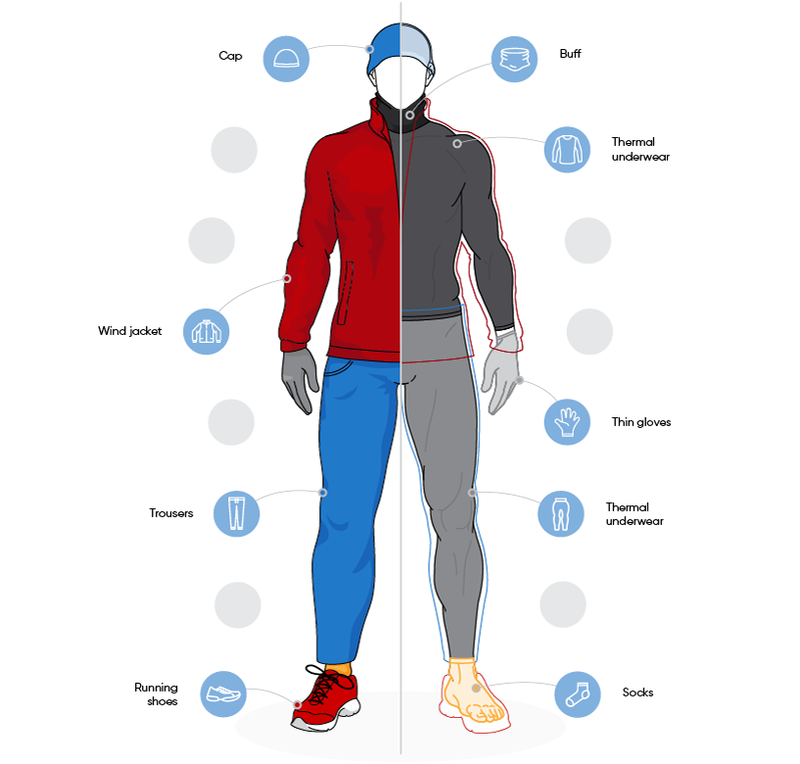 Oddly enough, while running in winter, the legs are less likely to freeze. It is because they are very active and emit heat. But toes are the most vulnerable, and usually, mountain climbers freeze them first. You know what happens next with the leg, right? :) Therefore, we need a complex approach. In one word, I had to test everything by myself. I bought a few pairs of sneakers: Hoka Speedgoat Mid WP, ​​Salomon Speedcross 4 gtx and Asics Gel-Arctic 3. They are all made of membrane and destined for winter running. I purchased 2 sizes larger sneakers, in order to be able to fit in with thick socks and still have air cushioning. Salomons turned out to be tough, but the thin sole let the cold in. The Asics were heavy — more than 400 grams (14.1 oz), and the sole was also freezing. 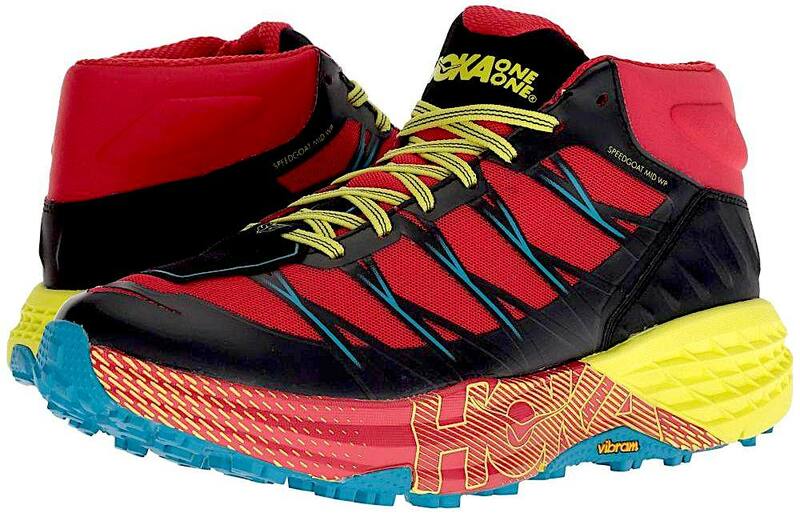 Hoka seemed the most comfortable, due to sole softness and thickness. In fact, I did not run more than 10 km in each pair, but it was enough for me to pick the most comfortable ones, and I was right. The Hoka did well for 50 km (31.25 miles) at -60 °C (-76 oF), the sole did not crack, they did not get wet, they breathed, but did not let the wind in. While I was thinking about the running at such low temperatures, a thought crept in: “I am an engineer”! 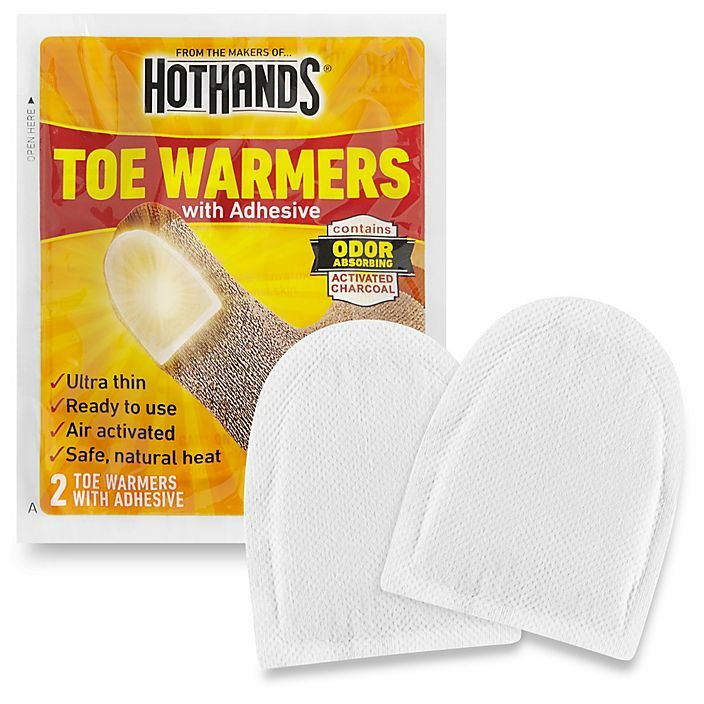 So I thought: why not find electric insoles, so I would not freeze my toes? No sooner said than done! 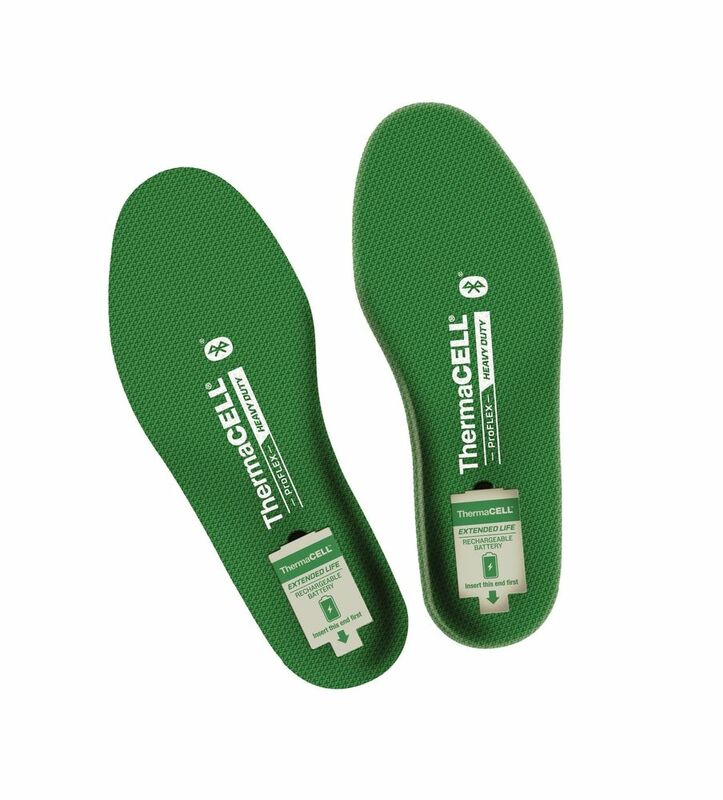 I purchased two pairs of thermo-insoles on batteries: ThermaCELL ProFLEX. The warranty is 6 hours of heating. I cut them by my size and charged them 100%, and I went to work to test them during the day. They have a handy remote with three modes. It turned out that the insoles could work for three hours with high heating (+37 oC (+98.6 oF)), but at low heating, I couldn’t feel anything. At my trainings in Tomtor (at -50 oC (-58 oF)), the insoles proved nothing, apart from adding 100 grams extra weight on each leg, and so I decided to put them inside my walking boots. They served faithfully there. Socks are an important component for comfortable running. 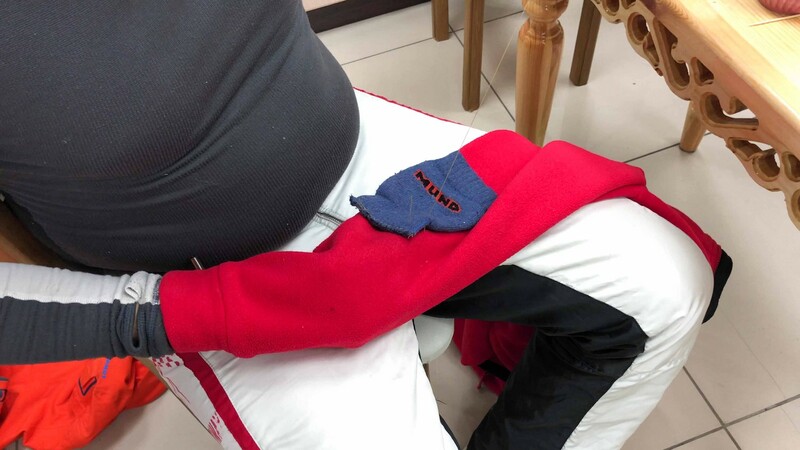 I took a few pairs of wool socks, but my tests in Orenburg, at -35 °C (-31 oF) showed that they have a downside of getting wet, heavy and then freezing. I was already desperate to find a good solution. Suddenly, a week before leaving for Yakutsk, I came across Sealskinz Trekking Thick Mid membrane socks. Wow! Amazing! You can walk in these socks through puddles and not get wet. The foot is always dry, because water vapors easily come out through the membrane. I bought those socks and fell in love with them, because my feet were dry and very warm, though they are made of synthetic fibers. For comfort, I have put liners under them – thin woolen Icebreaker socks, a type of thermal “underwear” for feet. But that’s not all. I ran out in all of this equipment, and a half an hour later I felt that my toes went numb with cold, though the whole foot was warm. What to do? Answer: stick some heat packs on top of your socks and put the sneakers on. What to wear for a walk? What to wear for a walk on such a cold winter day, if you are not sensible to cold? 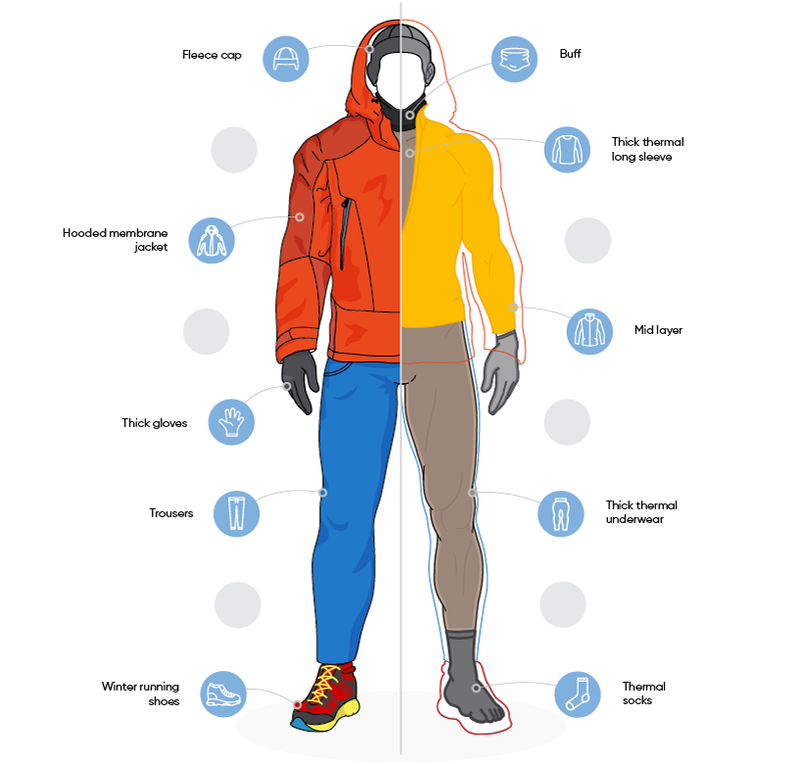 Personally, I prefer down pants and Rab Batura Jacket, thermal underwear and Salomon Toundra PRO boots with thermal insoles. — Dima, get yourself back inside and put on some warm clothes, otherwise you’ll catch a cold! Well, that seems to be all. Now you are ready to run at any temperature of our planet. The end of theoretical part. 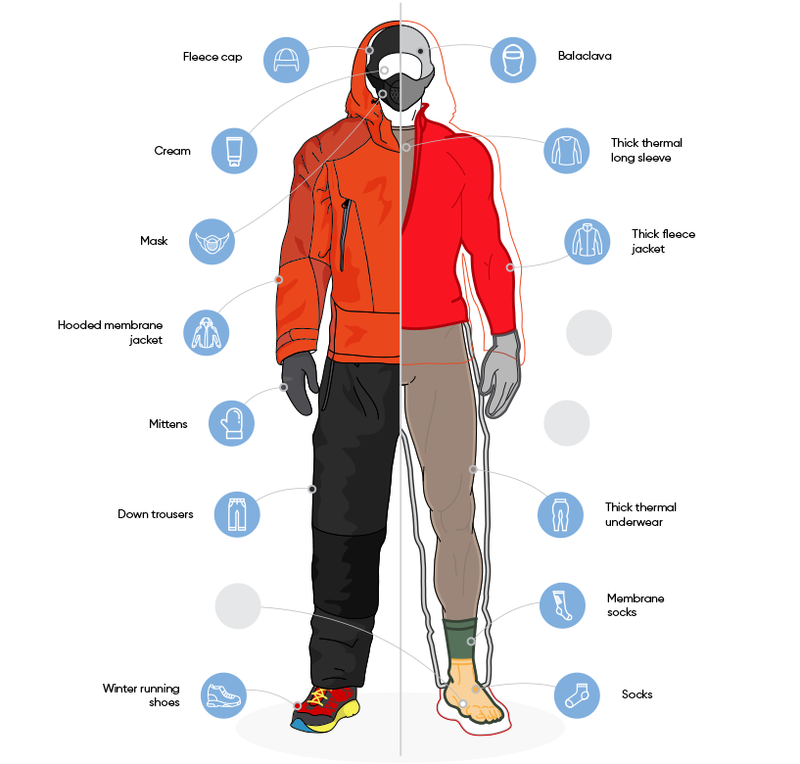 In the next chapter, which is more practical, I will tell how, with all these technologies on, you can (or can’t) run an ultra-marathon at -60 °C (-76 oF).